There are demons hiding in the bubblegum! 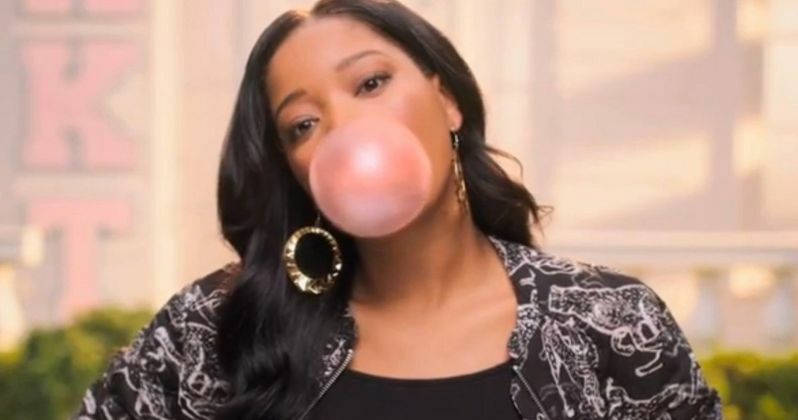 The third teaser has arrived for Fox's new horror anthology series Scream Queens, and this time it's star Keke Palmer who is blowing bubbles for Satan. This latest sneak peek falls in line with the previous two videos, which also revolved around the art of gum chewing and the tricks that go along with it, which must be a favorite pastime for the sorority at the center of this spooky new comedy series. If Scream Queens looks like a mash-up of Glee and American Horror Story, it's because it comes from producers of those shows Brad Falchuk and Ryan Murphy. Though, it remains to be seen if there will be a musical element to the series. This first season will revolve around a mysterious slasher who is killing students and faculty on a college campus. So far, no other details have been released. Keke Palmer will be joined by American Horror Story alum Emma Roberts, who was seen blowing demon-filled bubbles in the previous teaser. Glee star Lea Michele is also coming abroad this crazy train, which will be headlined by the original Scream Queen herself Jamie Lee Curtis. Other members of the ensemble include Abigail Breslin, singer Ariana Grande, Nasim Pedrad, and Oliver Hudson. We won't get our first real look at Scream Queens until this fall, when it premieres on Fox. But we're sure to get more trailers in the coming weeks. Who will arrive next to blow big bubbles for Beelzebub is anyone's guess.